The rapid elevation of atmospheric carbon dioxide level has led to global warming and ocean acidification. Microalgae, accounting for nearly 40 percent of global carbon dioxide fixation on Earth, are on the forefront of mankind's battle against climate change, since many of them are able to directly convert sunlight and industrial carbon dioxide into transportation fuels and energy-rich nutrients. However, the high concentration of carbon dioxide in flue gases generally inhibits the growth of industrial microalgae. Therefore, reducing the so-called "CO2 poisoning effect," i.e., improving tolerance to high levels of CO2, has become a priority in the development of super microalgae for carbon fixation. In a new study published in Metabolic Engineering, a team of scientists led by Prof. XU Jian from the Qingdao Institute of Bioenergy and Bioprocess Technology (QIBEBT), Chinese Academy of Sciences (CAS), and Prof. Ansgar Poetsch from Ruhr University, developed a way to improve tolerance to high levels of CO2 in the industrial oil-producing microalgae Nannochloropsis. The research team started by discovering that CA2, a key enzyme of the carbon-concentrating mechanism (CCM), is a key sensor of the level of extracellular CO2. Then instead of enhancing the function of the sensor, they reduced its activity through RNAi-based gene knockdown. Surprisingly, the mutants were able to grow 30 percent faster than wild-type cells at a 5 percent CO2 level in flue gas, over 100 times higher than the 0.04 percent CO2 level found in air. Moreover, this advantage was persistent under various types of photobioreactors and a wide range of cultivation scales. In ancient times, Earth's atmospheric CO2 level was many times higher than today. Over millions of years of evolution, the CCMs of microalgae, whose role was to concentrate CO2 molecules around the prevalent carbon-fixing machinery called RuBisCO, have had to gradually adapt to lower and lower levels of atmospheric CO2. Therefore, by down-regulating CCM activity, the research team essentially turned back the clock of this evolutionary process and returned modern-day CCM to its ancient high-CO2-accustomed form. This "anti-evolution" endeavor by scientists improves the microalga's tolerance to high CO2 environments, such as that found in flue gases. 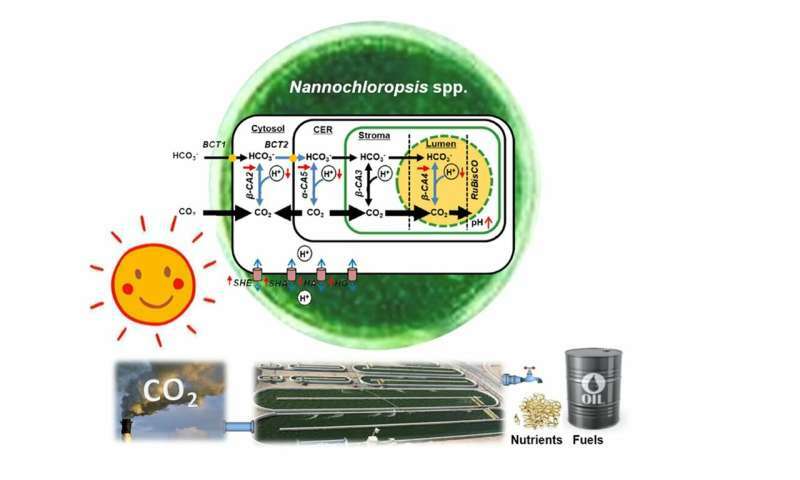 This novel strategy has general implications for the development of industrial oil-producing microalgae as well as food crops, under circumstances where high carbon levels are beneficial or even necessary. These circumstances can arise not only in the industrial conversion of flue gas to reduce carbon emissions and mitigate global warming, but also as mankind explores space in search of its next home. For example, on Mars, the most promising planet to serve as mankind's second home due to its short distance from Earth, the level of CO2 is as high as 95 percent. Thus, changing this hostile atmosphere to a human-friendly one is a must before Mars can be called home.